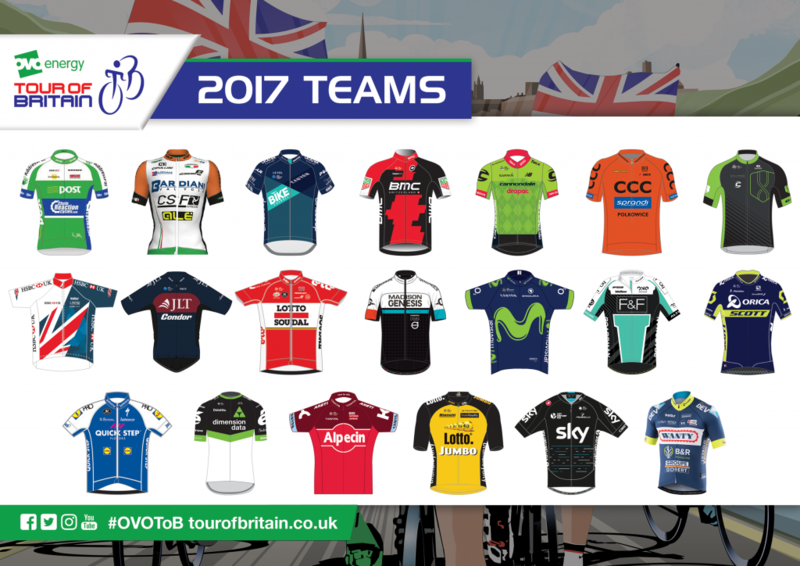 The 20 teams for the 2017 OVO Energy Tour of Britain have today (Monday 7 August) been announced, in a line-up that will feature ten UCI WorldTour teams, plus a further three squads that have competed in one of the two Grand Tours so far in 2017. All of the top five teams in the current UCI WorldTour rankings – Quick-Step Floors; Team Sky; BMC Racing; Movistar Team and Orica Scott – will be at the OVO Energy Tour of Britain. Returning to the OVO Energy Tour of Britain will be Team Katusha Alpecin, who have confirmed Alexander Kristoff, winner of the European Championship Road Race and Prudential RideLondon – Surrey Classic on consecutive weekends, and his teammate World Time Trial Champion Tony Martin, who won the Bristol stage last year, as part of their provisional line-up. Alongside Kristoff the OVO Energy Tour of Britain looks set to attract the world’s top sprinters, with Team Dimension Data’s Mark Cavendish targeting the Tour to return from his Tour de France injury, and Sky’s Elia Viviani publically aiming to add to his four stage wins in the race. Viviani’s Team Sky teammate Geraint Thomas has already vowed in interviews to race the OVO Energy Tour of Britain for the first time since 2011, with the overall finish of the Tour in his home city of Cardiff for the first time on Sunday 10 September. Commenting on the line-up, OVO Energy Tour of Britain Race Director Mick Bennett said; “We are delighted with this year’s line-up of teams for the OVO Energy Tour of Britain and with riders of the calibre of Geraint Thomas, Mark Cavendish and Alexander Kristoff coming out to say they will be targeting the OVO Energy Tour of Britain, this bodes for a fantastic spectacle for fans at the roadside and watching at home on television. A trio of teams will make their OVO Energy Tour of Britain debuts in CCC Sprandi Polkowice from Poland, America’s Cylance Pro Cycling and BIKE Channel Canyon. The latter are one of four domestic UCI Continental teams to have qualified for the Tour following their performances in British events during the course of 2017. The qualification process saw teams score points in British Cycling’s Spring Cup and Grand Prix Series, plus UCI events held in the UK, with JLT Condor heading the table ahead of ONE Pro Cycling, BIKE Channel Canyon and Madison Genesis. A provisional rider list featuring all 120-riders for the OVO Energy Tour of Britain will be published towards the end of August. The OVO Energy Tour of Britain gets underway in Edinburgh on Sunday 3 September, beginning from the city’s iconic Royal Mile outside St Giles’ Cathedral. Following the depart of the world’s top teams and riders in Stage One, amateur cyclists will have the chance to ride around Edinburgh on traffic-free roads in the HSBC UK City Ride. Spectators are encouraged to register in advance for their free place, by clicking here. Jonny Clay, British Cycling’s director of cycling, said: “This stellar line-up of riders again reinforces the regard in which the OVO Energy Tour of Britain is held among the world’s best riders and teams. We are extremely proud that, yet again, some of the most recognisable faces in our sport will be racing on British roads, inspiring the next generation of cyclists. OVO Energy, the UK’s top rated independent energy supplier was announced as the title sponsor of the Tour of Britain at the end of April. Live coverage of the OVO Energy Tour of Britain will be shown on ITV4 and Eurosport in the UK, with both channels also screening daily highlights of the action.